If you are interested in waterfalls and not too fussed about the height, I think you will like Genoa falls in Genoa in the state of Victoria, Australia. Belonging to the Croajingolong National Park, Genoa falls is a set of small cascades of water each with a height of no more than 3 meters, located near the Victorian and New South Wales border. Genoa falls is located in about 488 kilometers East from the city of Melbourne and can be reached in about 5 and half hours’ drive. Access to the falls is via an unsigned dirt road which can be easily missed. I am sure there are many who are passing in Princess highway daily without knowing there is a small waterfall in this location. After turning to the dirt road, you just need to drive about 200 meters to reach the place to park the car. There is space to park 3 or 4 cars comfortably. This will not be a problem since this is not much of a famous attraction, so you will find space to park your car at any time of the year. At the car park, there will be a small sign mentioning that you are in the Genoa falls in Croajinolong national park. Camping, open fires and pets are not allowed to make you and others safe at the location. You have to walk about 500 meters to reach Genoa waterfall from the car park, I would say the walk is moderately difficult because the last part descending to the Genoa creek is having one or two steep steps and path is narrow. Better look for reptiles such as snakes and lizards on your way. Keep a good eye at your children if you got them on your trip since the area is hazardous specially with uncovered waterholes. Once you go down the final set of steps, turn left to reach the main attraction. It is a Basalt floor all the way to the waterfall with random water holes. In dry weather, you will be able to reach the waterfall without getting your feet wet. After the waterfall the stream will divide into two parts, one will be going behind the boulders and hidden, the other smaller stream will be visible, follow it downstream. In about 30 meters, to your left you will see the other stream joining back with two small waterfalls. Another good thing is that you can walk the breadth and length of the stream in dry weather without getting wet. When wet, be mindful, the area will be slippery with the algae build-up. I feel the water is bit Ionic from the slight Brown colour seen. Apart from space to park the car, there are no facilities available on site. So, if you plan to have a barbecue or a picnic, this is not the place. Also, be prepared to carry your garbage out, since there are no garbage bins available. 3 Accessibility Moderately difficult walk of about 15 minutes from car park. Hope you will enjoy the video. Today I thought to post an article about the highest waterfall in Victoria, which is Agnes Falls in Hazel Park, Hazel Park is a suburb in the state of Victoria in Australia. Agnes falls is located about 200 kilometres South East of Melbourne city, which can be reached in about 2 and half hours’ drive from Melbourne city. At the end of the short walk you will have to go down few steps, so wheel chair and pram access is not possible. After walking down turning left will take you to viewpoint 2, which overlooks the mountains and the distance Toora windfarm. All viewpoints are well guarded and safe for little children, but if it is a rainy day, look for puddles of water in the main viewing area otherwise you will end up in wet shoes / feet. Spanning 59 meters, Agnes falls becomes the highest waterfall in the state of Victoria and has 3 cascades of water. Due to the quality of the water in Agnes river, it is found ideal for domestic use and Agnes river is used as a source of water for the nearby Toora township. The 1924 proposed water supply scheme ensured year-round gravity fed water for the township, and the first part was completed on 1926. There is wheelchair accessible toilets, few tables with benches and 2 undercover tables with seating to have a picnic. Remember to bring some bags to carry your garbage since there are no waste bins provided. 3 Accessibility Easily accessible within about 10 minutes walk from carpark. Watch the video and get a feel of the location before you plan your trip to Agnes Falls. 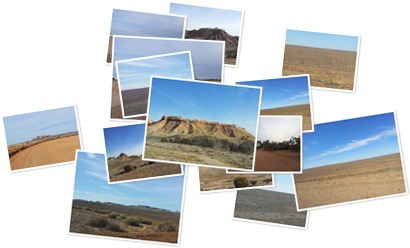 One of the most famous places in Australian outback is the painted desert. Which consists of different beautiful landscapes which was formed millions years ago while it way covered by water when it was under the sea. Since these attractions are in remote locations for some of us it will be difficult to find them. I agree some of the attractions are in the guide books but I assure you they are not that easy to find when you are on your own without any phone facilities or mobile data connections to browse maps. So for people who are interested in visiting these places I hope this article will help them to locate some of the attractions. Remember to cache your GPS or maps before you leave town or simply buy a detailed map. All these places are accessible through unsealed / dirt roads and it is always better if you have an AWD or a 4WD. But if you are travelling in dry whether and if you are cautious you will be able to visit all of them in a 2WD as well. Few other things to remember when going to outback places are mentioned in my other post. 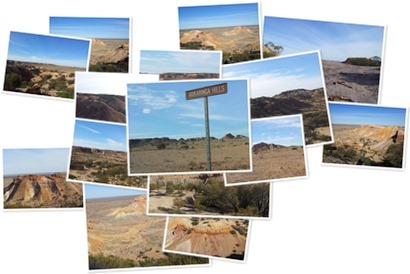 You will not miss the road to the lookout since you need to turn right just before the Dingo fence when you travel from Coober Pedy to Oodnadatta. There will also be road signs for this. Dingo fence or Dog fence is holding the title of longest man made object in the world having a length of 5614 kms. This runs from Surfaces Paradise in Queensland to Bight in near Western Australia border. This was put up to protect the live stock on the south side of the country from the northern predators. You can have a look into this if you travel about 15 kms from Cobber Pedy to Oodnadatta. Painted desert lookout is also giving you a great view onto the vivid coloured mountains. There is a walk of about 15-20 minutes after parking your car. The way is marked in a nature friendly manner by collecting stones to make up arrows as seen in my photos. Some parts of the walk is bit challenging so if you do not like walking or afraid of heights or slopes best is to wait in the car. On your way to these you will encounter other interesting natures creations as well.